New research shows how an unusual form of cosmic precipitation can affect the growth and evolution of galaxies. 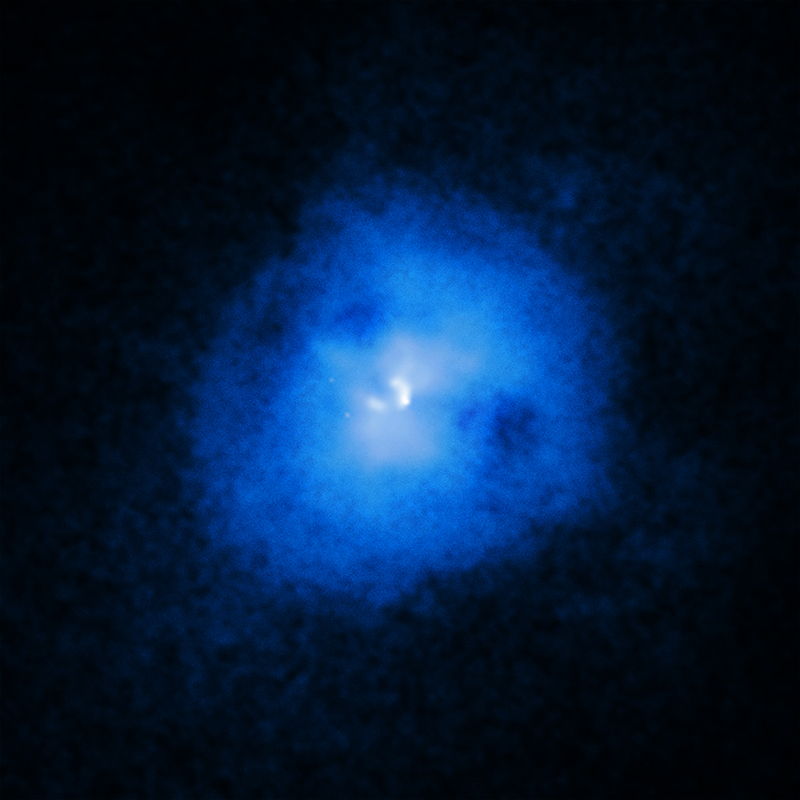 Over 200 galaxy clusters were surveyed in this new study using X-ray data from Chandra. These results provide evidence that this precipitation can slow down star formation in galaxies with giant black holes. According to this new study, the regulation of the largest black hole and their host galaxies works as follows: in some galaxies, such as NGC 2597, hot gas is able to quickly cool through radiation and energy loss, in a process called precipitation. The clouds of cool gas that result then fall into the central supermassive black hole, producing jets that heat the gas and prevent further cooling. The researchers used Chandra data to estimate how long it should take for the gas to cool at different distances from the black holes in the study. Using that information, they were able to accurately predict the "weather" around each of the black holes. They found that the precipitation feedback loop driven by energy produced by the black hole jets prevents the showers of cold clouds from getting too strong. The Chandra data indicate that the regulation of this precipitation has been going on for the last 7 billion years or more. While a rain of cool clouds appears to play a key role in regulating the growth of some galaxies, the researchers have found other galaxies where the cosmic precipitation had shut off. 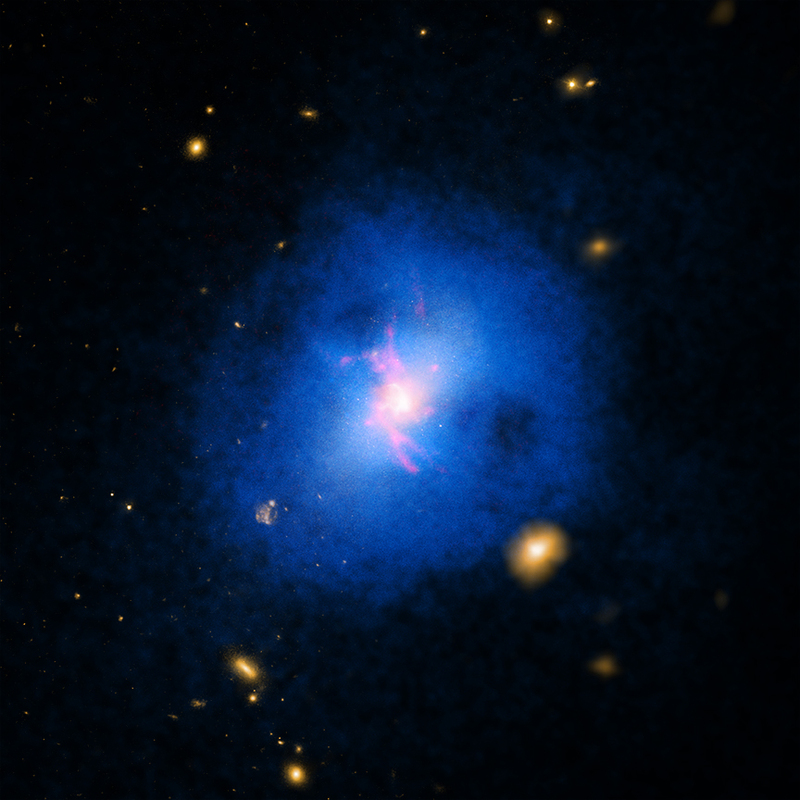 The intense heat in these central galaxies, possibly from colliding with another galaxy cluster, likely "dried up" the precipitation around the black hole. Evidence was also found, in a few galaxy clusters, that strong bursts of outflows from regions near the black hole may have temporarily shut down precipitation, but the heating is not strong enough to result in conduction. In these cases, further cooling of gas should occur and active precipitation should resume in a few hundred million years. Coordinates (J2000) RA 23h 25m 19.6s | Dec -12° 07' 27.4"
Observation Time 42 hours 7 min (1 day 18 hours 7 min). If a black hole collides with another, they do not disappear, study has shown they combine and become a single larger black hole. What happens if two black holes devour each other will they disappear? Thank you for this wonderful article. The theory of galaxy growth continues to fascinate and this seems to go a long way to explaining what prevents further growth, however, there is still a question of why the black hole can't absorb more matter preventing its runaway growth which confuses. A galaxy cluster located about one billion light years from Earth. About 1 billion light years. X-rays from the Chandra, optical data from Hubble and the Digitized Sky Survey and emission from hydrogen atoms from the Walter Baade Telescope in Chile. X-rays are blue, optical are yellow and H-alpha are red.